have you recently got Braces? Are you wondering how to keep you teeth clean when you have braces? Braces are very important as they can help a child or adult with orthodontic problems have a radiant smile. This is because of the fact that getting braces enables you to get beautiful healthy teeth at the end of your orthodontic treatment. However, in order to achieve this, you need to consider a few things. 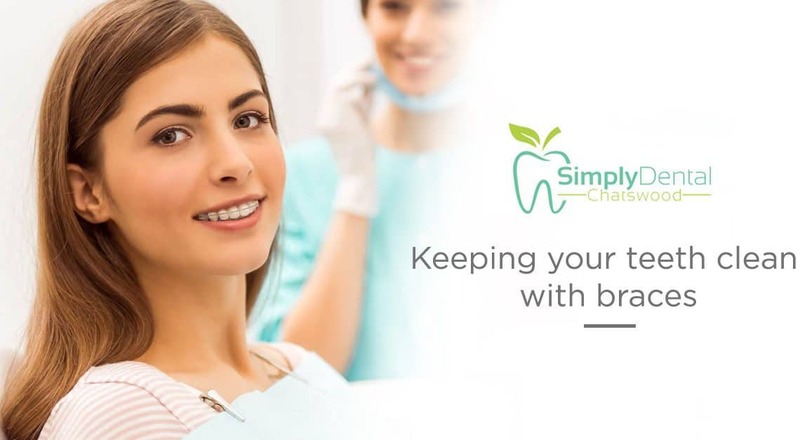 While you are wearing braces, food particles and plaque can take advantage of the additional places braces have to accumulate around wires and brackets. This can lead to gum disease, tooth decay, and bad breath. A soft-bristled manual or electric toothbrush and fluorinated toothpaste are the best choices for those who want to clean their braces. Brush at an angle of 45 degrees to the gum line using small circular movements. After this move to the brackets, angle down to reach on top of the brackets and then angle up to reach under the brackets. Also, remember to brush the tooth surfaces used for chewing and inside surfaces. In most cases, you will see kids with partial braces or expander plates. The manual dexterity required to brush in an effective manner doesn’t develop in children until they are 10 years old. Therefore, as hygienists, we advise parents to pay attention to brushing times and help when necessary to make sure that all the family members have clean, healthy mouths. It is always important to come up with a flossing routine especially those wearing braces. Flossing prevents food particles and plaques from accumulating under the gum as it dislodges them before they turn into calculus. Flossing can also reach small areas and spaces that a toothbrush cannot reach. We recommend Superfloss, a three-component floss that makes flossing easier. Superfloss has a stiff end that flosses under the braces, a spongy floss that cleans around orthodontic appliances and in wide areas and standard floss that cleans below the gum line. It is also important to remember that some younger children don’t have the manual dexterity required to floss teeth and need some assistance. These brushes are excellent tools for reaching around brackets and wires. They can easily dislodge food particles that may be caught at meal times. Interdental brushes should be used in conjunction with brushing and flossing. They should never replace the role of flossing in reaching interproximal areas. Sometimes, it can be hard to see plaque. This is mainly due to the fact that it starts building up on the teeth and around braces. One way to spot plaque is using disclosing tablets once every week after brushing your teeth. These tablets stains plaque pink hence making it easy to see and remove with brushing. This makes disclosing tablets a great visual aid for both kids and adults. If you want to maintain optimal oral hygiene, then ensure that you continue regular dental visits while undergoing orthodontics. Regular visits to your Sydney Dentist-Chatswood will ensure that your teeth are clean and healthy and can point out areas that may require more attention.